Distress Equipment - What the RYA/RNLI/MCA recommend you carry aboard. Guidelines for pleasure craft under 13.7m in length, compiled with the RNLI and MCA, outlining the combinations of equipment including flares, EPIRB, and VHFDSC, you could consider carrying and using to indicate that you need assistance, depending upon the type of your vessel and where you use it. This entry was posted in Safety, Tips and Advice and tagged EPIRBs, Flares, VHF, Safety on August 31, 2010 by Iain Forrest. beware of planks and bundles of wood that fell off the 79 metre Norwegian registered vessel ‘Sally’ in heavy seas off the east coast of the UK. The cargo loss was about 55 miles due east of Lowestoft. This entry was posted in Safety and tagged lost cargo on August 31, 2010 by Iain Forrest. With the big boats in and the breeze dying it looks more and more like a win for IMOCA60 Artemis Ocean Racing. The smaller boats are still off the west coast of Ireland beating into light and variable southerlies. TP52 John Merricks II and Ker46 Tonnerre de Breskens 3 are battling it out off Start Point with easterly headwinds. This entry was posted in Race News and tagged Round Britain & Ireland, Sevenstar Round Britain and Ireland on August 31, 2010 by Iain Forrest. Update on the Round Britain and Ireland race. At 14:00 BST Thursday the vast majority of the fleet were in the remotest corner of the North Sea, hundreds of miles from any city and well offshore. The barren coastline of northeast Scotland was the nearest landfall. In essence, they were very much out on their own. Race leader Groupama had managed to struggle past the light winds around the Isle of Lewis and into fresher north easterly breeze. Getting to the breeze first means that they have opened up an 18 mile lead on rivals Telefónica Azul. Looking at weather further up the track, the wind speed is due to increase in strength, to as much as 25 knots. Soon enough, the two Volvo Open 70s in the Sevenstar Round Britain and Ireland Race will be launched like guided missiles, speeding down the west coast of Ireland Piet Vroon's Ker 46, Tonnerre de Breskens has regained the overall lead under IRC from Jonny Malbon's IMOCA 60, Artemis Ocean Racing, which led on handicap overnight. At 14:00 BST, Tonnerre was 27 miles south of Muckle Flugga and is due to round the most northern part of the course at 17:00. The easterly move by the TP52 John Merricks II has failed to pay dividends and they have dropped to sixth overall. This is another boat that revels in downwind surfing conditions and could easily make up the lost time to move up the leaderboard. This entry was posted in Race News and tagged Round Britain and Ireland, Sevenstar Round Britain and Ireland on August 27, 2010 by Iain Forrest. Is it making you dizzy, this round Britain backwards race? Probably a wise move considering the weather off the SW of Ireland today to send them off on an anticlockwise trip. Quite astonishing though that after yesterday's 2pm start Telefonica Azul is already level with the East Neuk of Fife under 24hours later. You can follow the race here. This entry was posted in Race News and tagged Round Britain & Ireland on August 24, 2010 by Iain Forrest. Sea Sickness: An endorsement for the Relief Band. The band definitely works. After a short trip from Newcastle to Sunderland I was miserably sick! We decided to order a band. We then sailed Sunderland – Hartlepool – Whitby – Hartlepool without any sickness. Remarkable! Thanks again. Robert Darby What is motion sickness? Different textbooks have different definitions, but basically motion sickness -- also called air sickness, sea sickness or car sickness -- is nausea and vomiting triggered by disturbance of the vestibular apparatus. The vestibular apparatus refers to the semicircular canals of the inner ear which we use to maintain balance and sense orientation and movement. One theory of motion sickness focuses on sensory conflict. Cruise ship passengers are far more likely to get seasick when below because their vestibular sense detects motion while their eyes reveal motionless surroundings. The standard advice for seasickness is to get up on deck where visual input agrees with vestibular input. Likewise, studies have shown that a child is far less likely to experience car sickness when in an elevated child seat that provides a good outside view. Motion sickness produces a whole range of symptoms, of which nausea and vomiting are the most severe. Actually, symptoms generally follow a path of increasing severity. Early indications of motion sickness onset may include headache, increased salivation and swallowing, eructation (a nice medical word for belching and burping), flatulence (same idea, different orifice), pallor and cold sweats. The victim may then develop nausea -- which is defined as the sensation associated with anticipation of vomiting -- and ultimately may experience emesis (the medical term for vomiting) or retching (unproductive vomiting movements). Motion sickness remedies can be classed as drug or non-drug. I have found Stugeron to be a particularly effective drug, one which does not induce sleepiness. Non-drug treatments include Ginger, Acupuncture or the Relief Band which stimulate the median nerve on the inside of the wrist. Acupuncture is not practical aboard and out at sea. The Relief Band weighs 1.2 ounces and contains electronics plus a pair of coin-size lithium batteries. The underside of the device has a pair of gold-plated electrodes that contact the skin. To use the device, the wrist is first cleaned with an alcohol swab, after which a small dab of conductive gel is applied to the skin (same stuff that's used when you take an EKG). The Relief Band is positioned so that its electrodes are between the two tendons on the inside of the wrist, about an inch from the skin crease between the wrist and palm. This places them above the median nerve. The face of the Relief Band has a dial that permits the device to be turned on and off and adjusted to any of five stimulation levels. The face of the unit clearly displays the selected intensity, labeled 1 through 5. The face also has a two-color LED that blinks green to verify the unit is working, changing to red when the batteries are within eight hours of becoming exhausted. Upon the first signs of distress, the wearer turns the device on and adjusts the dial until a mild tingling sensation is felt. For maximum battery life, the unit should be adjusted to the lowest setting that provides the desired relief. Nominal battery life is 144 hours at the medium-intensity setting, after which the batteries can be easily replaced. The Relief Band uses two standard CR-2025 coin cells. If you have not acclimatised to the motion of the boat after 6 days, you shouldn't really be out there! The Relief Band has undergone extensive clinical trials in the control of nausea and vomiting. It is presently FDA-approved as a treatment for nausea in chemotherapy patients, for the control of "morning sickness" in pregnant women, and for relief of motion sickness. Cancer patients don't like the available anti-nausea medications because they either don't work well or are so sedating that the patients cannot function while taking them. The Relief Band suppresses nausea and vomiting with no sedative side effects, and it even works on "anticipatory nausea" of chemotherapy on which meds do not work at all. Hyperemesis Gravidarum is the medical term for the intractable vomiting associated with pregnancy, colloquially referred to as "morning sickness." It's a huge problem for physicians because you really don't want pregnant patients taking anti-nausea medications due to the possible effects on the baby. Relief Band is highly effective in this application too. This entry was posted in General Interest, Tips and Advice and tagged Chemotherapy, Morning Sickness, Motion Sickness Remedy, Relief Band, Sea Sickness on August 23, 2010 by Iain Forrest. A 14-year-old Dutch girl will set off today, on a controversial attempt to become the youngest person to sail solo around the world, her representatives said. Laura Dekker's ambition of completing the yearlong trip has fueled a global debate over the wisdom of allowing young sailors to take on the tremendous risks of sailing the high seas alone. The girl who grew up on a sailboat faces a host of challenges -- including favorable winds to send her across the Atlantic Ocean from her jumping off point in a marina in the resort city of Portimao at the southwestern tip of Portugal. Late Friday, seas were so calm that the ocean looked like a mirror, and Laura was still out in her boat, performing last-minute tests on her red-hulled 38-foot (11.5-meter) yacht named "Guppy." Australian Jessica Watson, completed a 210-day voyage at age 16 earlier this year need not fear for her record. The Guinness' World Records and the World Sailing Speed Record Council have decided they will no longer recognize records for "youngest" sailors to avoid encouraging dangerous attempts. This entry was posted in General Interest and tagged Laura Dekker, Solo around the world, young sailors on August 21, 2010 by Iain Forrest. This is the fully crewed non stop race unlike the 2 handed race run earlier this year. 30 boats from 10 countries Austria, Britain, France, Germany, Holland, Italy, Lithuania, South Africa, Spain and Sweden are making it quite an international event. If you are not taking part, you can enter the virtual race here. This entry was posted in Race News and tagged Round Britain and Ireland, Sevenstar Round Britain and Ireland on August 19, 2010 by Iain Forrest. Chart plotters give a visual chart display, and when linked to a GPS will show your position. They can also be used to create waypoints and can be part of an integrated system that will show other data. How they work For yachtsmen with an extensive range of paper charts, the original chart plotter which started the navigation revolution – the Yeoman – might be ideal. It uses paper charts fixed to an electronic board, and as you move the cursor around the board the changing lat and long is displayed on a screen. Plotters with charts stored on cartridges work on the same principle. To create waypoints all you do is zoom in and click the cursor and the lat and long is stored. So to make a route you just drag and click across the chart. This saves all the mistakes of transferring positions from a paper chart into a GPS memory. What to look out for No display is as big as a paper chart and big screens cost more money. For sailors who navigate on paper charts and just use a chart plotter as a ‘visual position reminder’, then a small screen is fine – as long as you are happy zooming in and out. Mono screens used to be easier to read in direct sunlight, but colour screens have improved and make details much clearer. However, do check that small details on the chart are clear, as some screens are quite pixelated. Also check that the symbols are to your liking, because the same chart cartridge in two different makes of chart plotter can create different symbols. The rate at which the charts redraw is worth checking, by scrolling north/south and east/west. Also try zooming in and out quickly. Charts These come in two formats, raster and vector. Raster charts are electronic copies of a paper chart but vector charts are made up of layers which can be turned on and off to make things clearer. If you are not sailing at night, for example, you can switch off all the light symbols for clarity. On some sets the lights that are within range of your position at night will start to flash with the correct characteristics. And if you are using the chart plotter combined with a radar overlay, it is often clearer if the main chart is under the radar image and then there is another layer on top of that, showing just a black coast outline with the navigation marks. Graphics More information is being added to electronic charts all the time – many now have satellite images that can be overlaid on the chart, aerial photographs, 3D displays of land contours that can be viewed from different angles and also 3D views of the sea bed. Obviously the basic charts don’t have all these ‘bells and whistles’ but it is worth comparing the different graphical styles of each cartography manufacturer. Most will only work with one type of cartography and this might influence which plotter you buy. Also check the areas covered by each chart cartridge – some makes might cover your cruising area more economically than others. 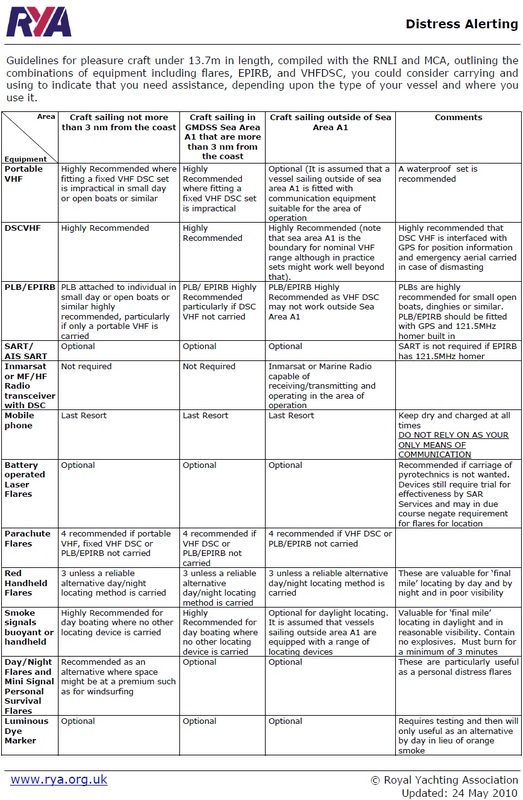 GPS - What are all these acronyms EGNOS, MSAS and WAAS? They refer to a capability found on higher specification GPS chartplotter units, with each of the three effectively offering the same service in different parts of the world. EGNOS - European Geostationary Navigation Overlay Service (Western Europe) MSAS - Multi-functional Satellite Augmentation System (Japan and East Asia) WAAS - Wide Area Satellite Augmentation System (North and Central America) These services augment the GPS service in their respective areas by reporting on the accuracy and reliability of the GPS signals and as a result increase the accuracy of compatible receivers from around 15 metres to on average 1 to 2 metres. Each system is made up of a combination of geostationary satellites and ground stations, and transmits a signal containing information on the reliability and accuracy of the positioning signals sent out by GPS. These are in turn transmitted to suitably equipped GPS receivers thereby enabling them to display the updated position information. This entry was posted in Electronics, Tips and Advice and tagged Chartplotter, chartplotters, gps on August 19, 2010 by Iain Forrest. The Sail for Gold results are in with a clutch of medals for Team GB, 8 in total. However I imagine our expectations were a little higher. This entry was posted in Race News and tagged Olympic, Sail for Gold, Skandia Team GB, Team GB, Weymouth on August 16, 2010 by Iain Forrest.